The best of both worlds.....children learning AND having fun! Many of these songs are animal related to help the children visualise as they learn about numbers and letters. These incredibly catchy tunes will encourage kids to sing along and this interactivity will speed up the learning process. 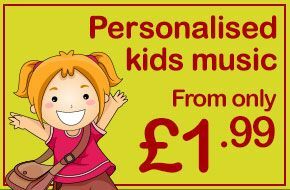 His or her name will be mentioned 20 times in total as they are encouraged to sing along.Ideal for children up to 7 years old, this CD will become a favourite: at bedtime, in the car or just for daytime entertainment. These CDs are not made to order.